A very handy program for viewing, moving and copying portraits for use in the game(s). It was made for the original Baldur's Gate but works for Baldur's Gate II as well. A collection of portraits taken from the rulebooks of Dungeons & Dragons 4th Edition; contains 644 portraits for each and every race, and a section devoted to NPCs; this pack is compatible with finnJo's sub-race mod, with appropriate alternative NPC portraits. This pack adds several (27) portrait sets of which some can be used by either Assassin/Thief characters while others are for Paladins/Warriors or for Rangers or Mages. This pack came together because the author was looking for this kind of portraits and has compiled a pack from pictures found in the game Assassin's Creed and from art by various Deviantart artists. 29 portraits for the Baldur's Gate series from art of one of the most overlooked fantasy illustrators, Quinton Hoover. He is probably well known to many players of Magic: The Gathering. The author has tried to cover as many classes and races as possible, so you should have no problem choosing faces for a whole custom party of six members. A Highlander: The Series portrait pack containing some of the more memorable characters of the show. One female portrait and five male portraits. They are rather evil looking and are appropriate for some sort of heroic villains or unlikely heroes. The pictures used are from games (illustrations from D&D, pictures from Fallout and NWN). All male (33) and female (20) Icewind Dale portraits (including those from Heart of Winter and Trials of the Luremaster), extracted and resized to work without alterations in Baldur's Gate 1 & 2. A selection of about 40 female portraits, some of which the author has made by scanning in pictures from game manuals, newspapers and a few other places, or that have been made by other people and she has edited. They generally fit in with the BGII theme. This portrait pack (18 portraits in all; a few of them variations of the same portrait) isn't exactly high fantasy. It's made for those who think that there aren't enough good ''Noir'' portraits around. These portraits aren't necessarily evil, just dark, gloomy and somewhat scary. A generic male human/half-elven/elven portrait specifically designed to match Shadows of Amn's existing portraits in color and drawing style. Suitable for warriors, thieves and fighter-mages. A selection of Final Fantasy 10 portraits for BG/BG2. It contains Yuna, Tidus, Lulu, Auron, Wakka, Rikku, Kimhari and Seymour. A pack of 14 male and female portraits, mostly made from fantasy art. A pack of evil portraits for BG players who want to play monsters or evil characters. Most of the portraits have been scanned and/or edited. The set includes portraits for Bodhi and Melissan, a female mindflayer, an ettercap, dragon, Jack Skellington (Nightmare before Christmas) and more. 5 portraits of Conan made from scans of various illustrations. A small collection of male and female portraits, made by editing various BG/IWD portraits. This is a collection of approximately 54 mostly female portraits collected from various sources. This package contains all 32 female portraits from Icewind Dale 2 for use in Baldur's Gate 2. 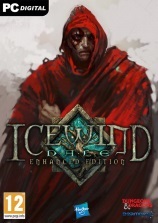 This package contains all 51 male portraits from Icewind Dale 2 for use in Baldur's Gate 2. This is a collection of approximately 150 female portraits collected from various sources. They are all very high quality and will fit well into any game of BG2. This pack was intended primarily for modders, as not every portrait has an appropriate large/small pic (most do, though). Rastor notes that graveyardstars deserves a lot of the credit for this one, as she compiled most of the pics. He has merely repackaged them in an easier to use format. An excellent collection of character portraits you can use to replace your own. Most portraits were scanned from various fantasy novel covers so you can expect to see portraits of Drizzt, Bruenor, Wulfgar and other FR heroes among them. A collection of portraits of various Discworld characters, scanned from the covers of the UK paperback releases of the novels. A huge collection of over 130 portraits, male and female, mostly from Neverwinter Nights, but also from other various fantasy sources.